For artists, songwriters, storytellers, and dreamers that are reading this, you are in luck. Creativity has won out against the darkness and monotony of neoliberalism. Imagination is revolutionary. The world has good reason to hope. The affirmative and liberatory project of the Zapatistas has spread its message around the globe: un otro mundo es posible. This credo can guide our imaginations onto new terrains, but the work of building and constructing worlds remains in front of us, daunting and formidable. How do we move forward, and what weapons will our creativity arm us with? Alex Khasnabish gives us some guidance in his book, but choices remain to be taken, and we will measure our success only from the viewpoint of the end of a lifetime of imaginative struggle. Zapatismo Beyond Borders: New Imaginations of Political Possibility (Alex Khasnabish, University of Toronto Press, 2008) explores the transnational resonance of Zapatismo - the guiding principles, tactics and beliefs of the Zapatistas - that has invigorated and inspired social activism and anti-capitalist struggles in North America. Khasnabish is a professor of sociology and anthropology at Mount St. Vincent University and Dalhousie University in Halifax, Nova Scotia. The book comes on the heels of his recent papers “A Tear in the Fabric of the Present” in the Journal for the Study of Radicalism (2009) and “Insurgent Imaginations” in Ephemera: Theory and Politics in Organization (2007), among other essays. Khasnabish's style reads like an academic thesis: rigorously documented, lengthy citations, and careful argumentation. Most accessible to academics, readers may find themselves wishing for a more palatable and digestible read. » continue reading "Book Review: Zapatismo Beyond Borders"
On Sunday October 12, activists from AW@L, Six Nations, Guelph, London, Kitchener, Toronto, Waterloo and Hamilton blocked the Olympic “Spirit Train” on the tracks as it approached Toronto, by locking down on the tracks and occupying a railway bridge. 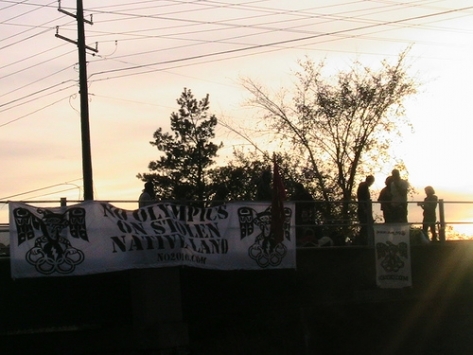 This highly coordinated and well executed non-violent action was taken in solidarity with the Olympic Resistance Network of British Columbia, the Native Youth Movement of the Coast Salish People, and the Anti-Poverty Committee of Vancouver, who have called for actions against the Spirit Train and all 2010 Olympic related activities. The non-violent action to block the Spirit Train was a resounding success as our goal to have national media coverage that actually spoke about the true issues surrounding the Olympics was met. Hopefully we have inspired others to take action as well. More and more people are gaining an understanding that the Olympics in general, and more specifically the 2010 Olympics in Vancouver, are no longer about sports and culture, they are about profit for a small elite and wide scale environmental destruction through development of stolen First Nations land. Canadian Pacific (CP) called the action a "serious safety risk", though no train was within five kilometres of the blockade as scouts were tracking the progression of the train from Sudbury. Also, the lock down team had full safety control of the situation by using a self-release device. CP followed their pre-set safety precautions and no one was ever put in danger. » continue reading "Activists block the 2010 'Spirit Train'"